In India, a lot of people suffer from obesity and find it very difficult to lose weight and nave a well maintained body. As it is, Indian food is rich in fat content and most of the dishes are made by adding ghee, butter and lots of oil. But there are also simple dishes that have low calorie content, which rich in nutrients, minerals and vitamins. But many of us tend to eat more than necessary and that too the food rich in fat content. This results in the accumulation of excess fat on the body, which leads to obesity. 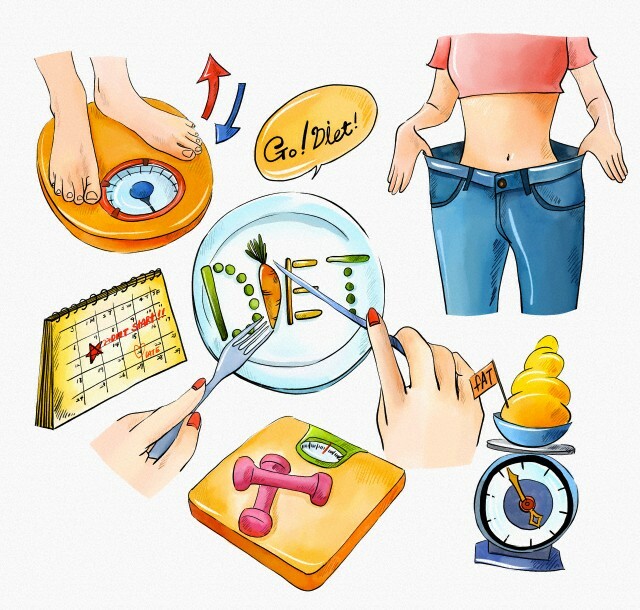 Once you have crossed the limits, it is quite a hard task to cut down the calories and lose weight. But if you have the will power and the determination, nothing is impossible. All you need to keep in mind is to follow a strict diet and follow it patiently. It should be a healthy and balanced diet, including items from all the four food groups, which are grains and legumes, milk and dairy products, fruits and vegetables and eggs and meat. You will soon see the changes that it will make on your body and will be happy for it. Skipping breakfast has adverse effects on your body. It is the most important meal in a day and you must never go without a breakfast. Having a sumptuous breakfast keeps you healthy and energetic throughout the day. It is recommended that you must have something that provides you energy for breakfast, like a bowl of porridge or a sup of low fat yoghurt (dahi). Water is necessary for the proper digestion of the food you consume. It also acts as a detoxifying agent. So you must make it a practice to drink at least 8 glasses of water daily. Drinking water is also beneficial for your skin and keep the skin healthy and glowing. Water has zero calories and it is also low in sodium. It aids in flushing out the toxins from your body and cleans your body. If it is impossible for you to drink plain water, you may have water to which lemon juice is added or you may drink tender coconut water. They are also very good for your health and help in weight loss. A lot of people starve themselves in order to lose weight. This is not a healthy habit. It will only make you week and make you at more food than normal. Moreover, it has a lot od adverse effects on your body. So you must consume enough food that is needed by your body, but keep in mind that they are low in calorie. You must always take care to eat healthy snacks instead of processed or fries food, which results in the accumulation of fat in your body. Healthy snacks like fresh or dry fruits, whole grain cereals, rice cakes, low fat yoghurt etc are good for your health and help in losing your weight. Sugar and starch must be totally avoided. You may have seen many people eating late at night. But this must be avoided as far as possible. You must have your last meal early, at least 2 hours before you go to bed. This helps in proper digestion of the food and prevents the accumulation of fat. You must take care to eat at least 5 portions of fruits and vegetables daily. Starting you day with a fruit is very beneficial as fruits are said to be very effective when you take them on an empty stomach. You must remember not to have fruits immediately after you have had a meal. Many people keep a long gap between meals thinking that it helps in losing weight. But it is highly recommended not to have a gap of more than 3 hours between your meals. This is because if there are long gaps between meals, the food you have consumed will be changed in to fat instead f being used for energy. This results in gaining of weight rather than losing it. So instead of having 3 meals a day, have five meals a day, taking care to keep the quantity of food consumed under control. Stimulants such as caffeine, alcohol and refined sugar should be avoided as far as possible. This is because they have negative effects on your health. Caffeine is harmful for your health when you take it on an empty stomach. So one must avoid taking bed tea or bed coffee. However, you may take tea or coffee with your meals. If you are serious in losing weight and are following a strict diet, keeping a watch on your calorie intake is very important. Food that is rich in calorie like fried food, sweets and pastries, ice-creams and chocolates must be avoided. Instead you may have fruits, lots of salads and boiled vegetables. These are low in calorie and also fill your stomach. Before you cook your food, you must remove all the visible fat from your food. Similarly, the milk you drink must be toned and devoid of any fat. It is better to have butter milk instead of yoghurt as butter milk has less fat. You must also avoid processed meat like sausages and burgers as contain high calories. Red meat also contains more fat. If you follow the rules strictly and also do enough exercise, you are sure to lose your extra weight and stay slim and trim. Having a healthy and well maintained body keeps you energetic and active and also protects you from various diseases and ailments. So do not hesitate, plan right now and follow the rules properly.